Students and Residents – Gain National Recognition and Advance Your Career! 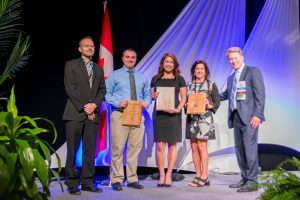 Enter to win one of two prestigious awards–The Student-Resident Poster award honors two meritorious scientific papers submitted for presentation as a poster at the 2019 National Assembly. The purpose of these awards is to encourage students and residents to display outstanding posters. The deadline is July 20. The Otto and Lucille Becker Award will be presented for the best orthotic abstract submitted and the Edwin and Kathryn Arbogast Award for the best prosthetic abstract submitted by a qualifying student or resident. The poster must be exhibited and presented at the 2019 National Assembly for the award recipient to receive the prize. 2018 Becker Award winner Peter Zenger, Arbogast Award winner Katherine Ching, and AOPA President Jim Weber, MBA. The winners will receive a $500 cash award, registration to the show, coach-class airfare to the National Assembly and three nights hotel. To qualify to present a poster in this category and eligible for consideration for this award, the main author must be a student (baccalaureate or master level) or a resident at a qualified patient care facility. More information about presentation logistics to follow.